Focal Utopia Review – Audio Perfection? Though they are without a doubt expensive the Utopia headphones are also very worth it, if you're the type of person who spends $4000 on a pair of headphones. If you haven’t heard of Focal, then you should start getting familiar. They’re a French company that’s been mainly dabbling in really high end audio gear for the better part of 30 years. It wouldn’t be uncommon to walk into a professional studio or high end audio setup of any kind and see a speaker or two with the logo on it. Since gaining success they’ve taken steps toward consumer friendly products like the Listen and Spark headphones we previously reviewed, along with their Sib Evo speakers that we also found really enjoyable. But the one product that everyone wants as of late are their $4000 Utopia reference headphones, which have many people claiming to be in the running for best headphones ever made. So are they the best? First off, the box is gorgeous. You don’t pay $4000 for a box, but the unboxing experience is second to none. The box itself feels like it’s made of a synthetic leather that feels smooth to touch, and when you open it a vivid red ribbon welcomes you to the headphones. There’s even some foam along the inside of the lid that gives you a hint as to where these belong: in the studio. Along with the headphones you’ll get some paperwork and instructions but that’s it. No fancy accessories or carrying cases here because after all, who’s really going to take these with them on the commute to work? There’s a lot to get through in terms of build and most of it’s good, but it’s not perfect. The headband is made of carbon fiber which is great in terms of strength and keeping these lighter than they would be otherwise, but there’s also an annoying amount of squeaking that goes on when you move them around. That said, it’s only an issue when you’re not wearing them because once these are on your head it conforms perfectly to it and you never hear any squeaks at all. Speaking of fit I had a hard time getting these to stay on if I moved my head too much. Not that they would go flying off (I don’t know how many people are going to be shaking their head like a wet dog while wearing these), but just something as simple as looking down caused them to slide off a little too easily considering how much it would cost me to fix them if they fell and broke. I would’ve definitely liked to see a bit more of a clamp on the head to prevent this from happening. On the bright side, these are insanely comfortable when they’re not slipping around. The ear pads and headband are made of a soft memory foam and covered in soft lambskin leather that perfectly float them over your head. As long as they don’t fall off you can keep these on for the longest of listening sessions and never feel like you have to let your ears breathe. At one point I wore these for a solid 5 hours straight while working and they were just as comfortable by the end as they were when I first put them on. The ear cups themselves look like something from the past and the future at the same time. They’re open-back so if you hold them up to the light you can see right through the mesh to the other side, save for the actual Beryllium drivers you’ll find suspended right in the middle, and the black and metal grill looks great. The one other thing we do need talk to talk about is the ridiculously high quality cable these come with, and I mean that in both a bad and a good way. This is without a doubt a great, high quality cable. But at almost 10 feet long it’s also kind of ridiculous. I get that these are intended for high-end listening sessions or studio use, and in the studio you might need some extra slack for when you’re moving around. But considering a) how easily these slip off the head when moving and b) how expensive these are, I can’t think of any reasonable person who wouldn’t first take these off and set them down carefully before moving around too much. And I mean very carefully. You plug the cables into the bottom of each earcup via Lemo connectors which snap in nicely and stay secure during use. The other end of the super long cable ends in a ¼” Neutrik jack which means that unless you’re plugging these into professional equipment you’re going to need an adapter. The cable has an impedance of 80 ohms and a sensitivity of 104dB SPL/1mW. I had to consult with fellow Sound Guys Chris Thomas and re-read his great piece on amps to make sure the math was right, but you don’t need an amp to power these. Music still played when I plugged them straight into the headphone jack of my Macbook Pro. That said, if you want to reach a decent listening level without needing to max out the volume an amp will definitely help. Now for the reason these headphones are so sought after: the sound quality. The reason I can put up with a heavy cable and the fact that they slide off my head when I look down. Everything you’ve heard about these is true. The Utopia’s sound amazing. The soundstage makes songs sound like you’re sitting in the middle of them rather than in a room where the music is being played, which is kind of weird to imagine but definitely impressive. The low end is there but I wouldn’t say “strong” is the word. They have a nice presence that let’s the bass guitar in “On Melancholy Hill” by the Gorillaz show off without muddying anything up. Vocals come through beautifully as well but what really stole the show was just the amount of detail that you’ll hear in songs you thought you knew. It’s sometimes hard to stay away from using cliches when you’re describing audio, but these really do reveal a new layer of sound in songs I’ve literally heard a thousand times. When listening to Bon Iver’s “Re: Stacks” it’s almost like I’m sitting next to him and can see his fingers hammering down on the strings 1:55 mark. The headphones also do a great job with the highs, giving guitar slides, squeaks, and creaks enough character to tickle the back of your neck without ever becoming harsh or annoying. 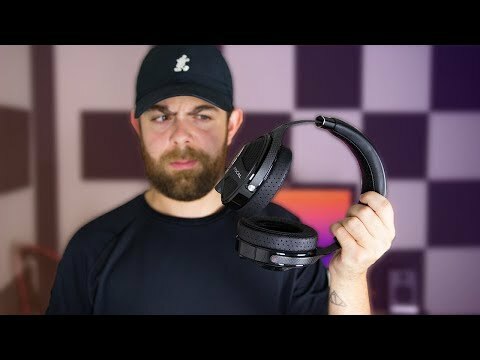 So at $4000 should you get these headphones? Of course not. You’d probably be better off getting a car or taking your family on a trip through Europe instead. But are they worth the money? Absolutely. If you have happen to have $4000 collecting dust in your bank account and love audio, you might as well just buy these right now. But make no mistake about it these are a grail item in the same way an expensive watch is. Though if you have to choose between a low-end Rolex you can pass down to your kids or the Utopia’s, I’d say be selfish and get the headphones. You deserve it. But for the rest of us it’s comforting just knowing that something likes these exist. Where something like the Sennheiser Orpheus headphones are exclusively for the rich and/or famous, the Utopia’s are a luxury item that’s just barely obtainable enough to be had if you really want them. Even if they slip off your head every time you look down.